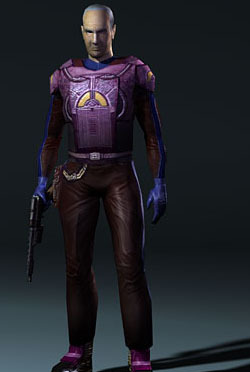 Davik Kang was head of the Exchange on Taris, an intergalactic criminal organization, during the Jedi Civil War. His headquarters were in the Upper City of Taris. Kang employed dozens of mercenaries and enforcers to keep Taris under his unofficial control, most notably the former Mandalorian Canderous Ordo and the bounty hunter Calo Nord. Davik collected the stuffed heads of ferocious creatures hunted and killed by Nord, but his most prized possession was his smuggling vessel, the Ebon Hawk. Davik resented the Sith presence on Taris because their planet-wide blockade had halted his his inter-galactic operations, but he knew well enough to avoid bothering them. After rescuing Bastila Shan from the Black Vulkars, Revan (whose identity was secret) was approached by Canderous, who offered Revan the chance to leave Taris, provided he could retrieve the necessary planetary launch codes from a nearby Sith military base. Revan agreed to steal the codes in return for Canderous convincing Davik to hire Revan as another mercenary. The situation was beneficial for both Revan and Canderous, and the two worked together to steal the Ebon Hawk. Revan and his companions made for their escape while Darth Malak began bombarding the city into dust from orbit. Outraged at the treachery of both Canderous and Revan, Davik and Calo Nord attempted to stop Revan from stealing his ship. When Davik’s estate was directly hit by Malak‘s laser blasts, the hangar nearly collapsed. 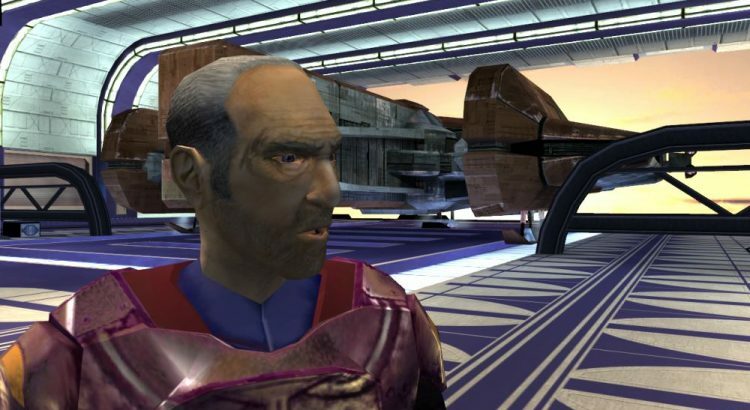 Calo Nord was able to escape—only to be killed by Revan later—but Davik was crushed beneath a falling girder, perishing along with the majority of the population. Kang’s powerful battle suit was a legend in itself. Rumor had it that it was so incredible, being light and flexible yet extremely durable, that Kang decided to kill the ingenious technician who constructed it, assuring that no one had a suit of a similar design. The ganglord was eventually stripped of the armor by Revan before his escape from the collapsing city.